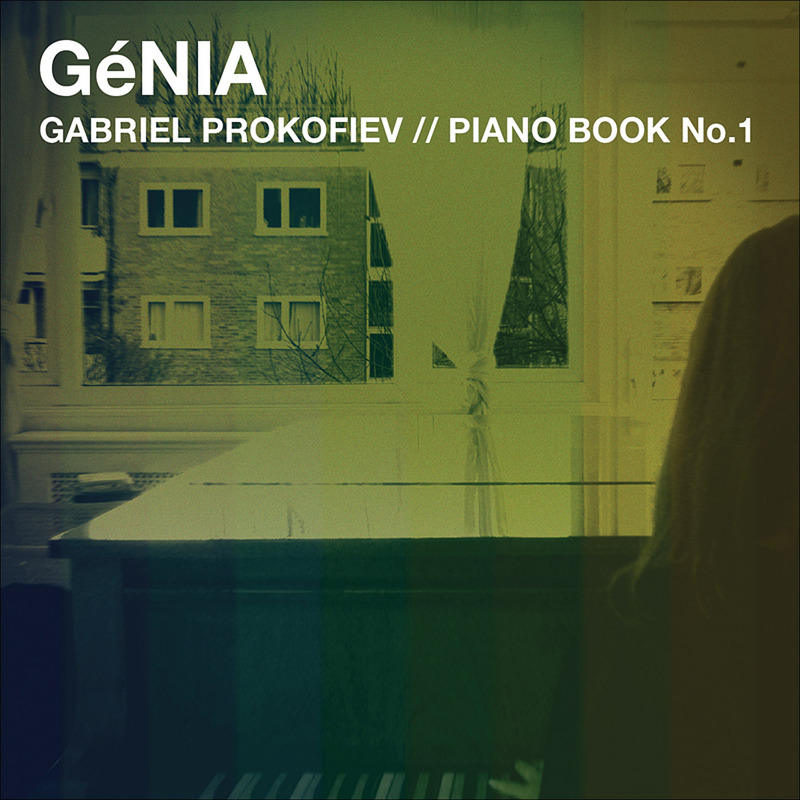 When Gabriel Prokofiev first heard virtuoso pianist GéNIA, he was so inspired by her incredible control of the piano and expressive touch that he put aside previous reservations and decided to write a book of piano pieces for her. Initially he tried to veer away from the more traditional piano writing influences that had informed his early musical life (Chopin, Bach, S Prokofiev, Bartok et al). However, as the compositions started to take shape, it became evident that this connection to the past was unavoidable; with GéNIA encouraging Gabriel not to suppress his instincts. Yet this Piano Book is by no means a work of nostalgia; lurking under the surface of what occasionally sound like traditional harmonies and textures are subtle discords, pedal effects, rhythmic distortions, and even techniques that would normally be found in electronic and urban music settings. Piano Book No. 1 contains all the usual, or should we say ‘unusual’ traits of Gabriel Prokofiev’s compositional style. There is a strong descriptive character in many of the pieces with ‘Cold Wooden Window’ clearly alluding to the shared Russian ancestry of Gabriel and GéNIA. ‘Tough Moves’ combines a hip-hop feel with romantic tremolo effects and ‘Fky House’ employs low bass clusters to work in the manner of drum patterns in dance music. Then ‘Glass swing’ is a 21st century bastardisation of Bach-styled 2-part invention. 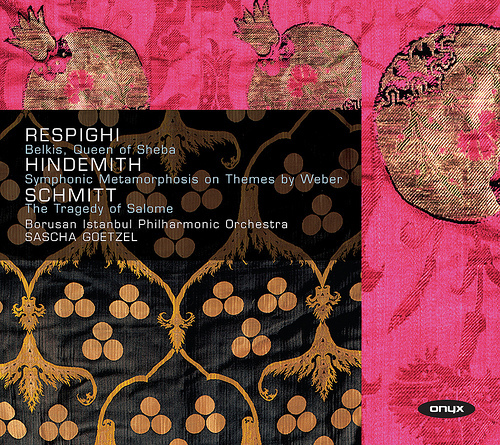 Gabriel’s method is perhaps comparable to the poly-stylistic writing of Schnikte, and his intuitive approach reveals that modern classical music can be sensitive and unafraid of bridging the gap between seemingly disparate musical worlds. GéNIA’s subtlety of expression combined with her faultless technique enable her to unite the contrasting elements of Gabriel’s music seamlessly, creating effortless . Both performer and composer are well known for their pioneering attitudes in the contemporary classical world, with GéNIA having previously commissioned over 20 pieces for piano and electronics and developed a multidimensional playing technique called Piano-Yoga®. GéNIA’s UK debut in 2001 was met with critical acclaim and Nonclassical are proud to release their 2nd album together. Piano Book No. 1 connects more to the classical tradition than previous Nonclassical releases, showing that though they may present classical music in a non-classical way, Nonclassical are still interested in continuing the legacy of classical music and moving it forward. One of the aims of GéNIA and Gabriel’s collaboration was to create an intimate sounding piano album that connected to the classic recordings of the past. This led to 88.2k digital recording of a hand-picked Steinway D-Series piano which was then mastered through analogue tape and vintage valve equipment, without compression. If you look at the Spotify Top lists you usually see the standard hit makers like Lady Gaga and Beyonce, but if you dig a little deeper you’ll quickly find that Spotify has a lot more to offer than just the standard top forty. One area we take great pride in is our classical section and a large part of that genre comes from the catalogue of Decca Records which we recently finished adding to Spotify. Decca Records combines a large number of releases from its own label along with music from Universal Classics & Jazz and the extremely popular Deutsche Grammophon and Decca label. Now, many of our users might not know where to start with such a large selection so the good people over at Decca have gone ahead and put together a series of playlists for you to check out. For the beginners we’ve got Mozart for Dummies and Classical for Dummies and for the more advanced check out Classical for Experts. A few more specific playlists include Favourite Mahler, Trumpet Favourites, Best Beethoven and Handel Hits and if you’re in the mood for something a little more relaxed check out Classical Chill Out. It is the place in Beethoven’s Ninth Symphony that the tenor dreads. The orchestra turns “Turkish” — signposted by bass drum, cymbal and triangle — and jangle along as the singer fields an exposed verse of the Ode to Joy. Sure enough, the singer for the performance by the Borusan Istanbul Philharmonic Orchestra (BIPO) came a cropper. But he was a German import. Turkey’s newest and fastest-growing orchestra honoured Beethoven’s Oriental homage with native panache. The Borusan Philharmonic is riding a new wave of enthusiasm for classical music in Turkey. Istanbul is one of three European Capital of Culture cities in 2010, promising such offerings as a world premiere by Arvo Pärt and a residency by the Simón Bolívar Youth Orchestra. But back at the launch in January, Istanbul first snored through a worthy presidential ceremony and then partied as the country’s No 1 pop star, Tarkan, gave a live performance in the throbbing central hub of Taksim Square. The neomodernist musical movement that followed the second world war, and whose leading lights were Stockhausen, Boulez and Berio, was an undertaking of the highest seriousness. Not only was the language of music to be reconceived from top to bottom, and sideways, too, every work, it seemed, must have a global ambition. Stockhausen’s early scores — Kontra-Punkte, Gruppen, Carré, Kontakte, Momente, a grand progression — proposed, in each case, a new technique of composition and embodied it with monumental certi tude. Each was an enormous event, promptly recorded by Deutsche Grammophon, and intended to last. And, indeed, they have become the classics of “serialism”, along with such works as Boulez’s Le Marteau sans maître or Berio’s music-theatre essay Laborintus II — not that they are performed as often as Mozart. It was remarkable, therefore, a week ago to find that Laborintus II was being mounted by separate groups on successive nights: by the University of Birmingham’s Music Department in the Methodist Central Hall, Birmingham, and by the Aurora Orchestra with Mahogany Opera at LSO St Luke’s, in London. And, since the Birmingham concert was repeated the next day, their second Laborintus would have coincided exactly with the Aurora one. This wasn’t the only attraction of an unusual event called Squares, Circles, Labyrinths, directed by the composer Vic Hoyland. Stockhausen’s Carré was the first item, and between the two intervals of the triple-decker programme, the Birmingham University Singers, under Marcus Huxley, performed those pre-20th-century classics of “music in space”, Allegri’s Miserere and Tallis’s 40-voice motet Spem in alium. For its (triumphantly resolved!) experiment with the spatialisation of sound is what makes Carré fascinating and gives it its title (“Square”). Four orchestras, each with its own conductor (Jonty Harrison, Lee Differ and Scott Wilson, along with Hoyland) play simul taneously, and ideas and gestures seem to move from one to another, circulating in the room, rather in the fashion of Gruppen, for three orchestras, but without that work’s minutely distinguished time streams. To Gruppen’s relentless dynamism, Carré opposes a contemplative relish of sonority for itself, although the climax near the end was every bit as shattering as a Gruppen high point. Bangor New Music festival, held under the auspices of the university’s School of Music, celebrated its 10th anniversary with its most ambitious programme to date, and no concert signalled the event’s energy and range better than the one given by the BBC National Orchestra of Wales and featuring three firsts. The school boasts three notable composers – Pwyll ap Siôn, Andrew Lewis and Guto Puw – and works by them made up the challenging first half. Ap Siôn’s Gwales, dating from 1995, pays homage to the late William Mathias, under whose aegis music flourished at Bangor. Building on fragments quoted from Mozart’s Requiem, the work depicts a journey towards the mythical island of Gwales. In the first of the new pieces, Andrew Lewis also took us on a journey, this time in and out of consciousness. Number Nine Dream explored the first movement of Mahler’s Ninth Symphony through the hazy veil of the contemporary electro-acoustic sound-world, making for an absorbing aural experience. In the rarefied world of ballet, where dancers are expected to speak with their bodies, sometimes it seems that aloofness is something to aspire to. Lately, though, the ribbons are loosening. Courtesy of Twitter, dancers are starting to make themselves heard. It isn’t always dainty. Hanns Eisler, a Marxist for our time? Hanns Eisler is not, yet, a recovered voice. A two-time Oscar nominee for best score, the German composer, who fled the Nazis in 1933, was the first in motion pictures to be called up by the House Committee on Un-American Activities, and the first to be blacklisted in Hollywood. He was deported to East Germany in 1948. “I leave this country not without bitterness and infuriation,” he said before boarding a TWA flight at La Guardia airport. We have not known quite what to do with him since. On Saturday, the Villa Aurora in Pacific Palisades, once a hangout for the German émigrés in L.A., devoted a day to Eisler. A round-table discussion in the afternoon with American and German scholars looked at Eisler in general and at a peculiar part of his film work. In the evening, mezzo soprano Kristina Driskill and pianist Mark Robson persuasively performed much of Eisler’s pungent “Hollywood Songbook” from the composer’s L.A. years (1942-48). When the O2 Arena was infamous as the Millennium Dome, Peter Gabriel’s music for its central show was one of its redeeming features, but the experience still left him feeling bruised. So he was brave, this weekend, to bring a new concept to the same venue. Scratch My Back, his most recent CD, is a set of cover versions, all performed with an orchestra. “No guitars, no drums,” runs its severe rubric. The first half of the concert ran through the CD, in order, note for note and fault for fault. Some songs, notably Bowie’s “Heroes” and Paul Simon’s “The Boy In The Bubble”, are enervated by being stripped of pomp and swagger, although the former had a colourful passage of Reichian pulsing strings. Elbow’s “Mirrorball” has contorted melodies through which Gabriel would have sailed in his days with Genesis, but the kitschy orchestration muffled the key line: “We kissed like we invented it.” “The Book Of Love”, which in any case walks a fine line between the sincere and the sardonic, was trampled to death by headache-inducing cartoons. But a couple survived. “My Body is a Cage”, originally by The Arcade Fire, had its relentless oppression screwed home with tiny taps of the triangle, while the backdrop flared with pictures of a throbbing atomic nucleus orbited by barbed wire. And “Listening Wind”, a newly topical Talking Heads song about insurgency and terrorism, grew spiky staccato string polyrhythms. Read the full review in Financial Times here. A lot of the buzz this week in classical music circles will be about a lecture Alex Ross gave Monday in London for the nearly 200-year-old Royal Philharmonic Society, an organization dedicated “to create a future for music through the encouragement of creativity, the recognition of excellence and the promotion of understanding.” An edited version also appeared under his byline in the Guardian. Ross, music critic of the New Yorker and author of the widely praised book “The Rest is Noise: Listening to the Twentieth Century,” is not the first to question whether classical music is its own worst enemy, in terms of making the concert-going experience so stuffy, ritualistic and even prohibitive. But, naturally, he has expressed his views with more flair and insight than most. His primary focus, and the one that got online commenters and Twitterers going, was the oppressive no-applause-between-movements rule.